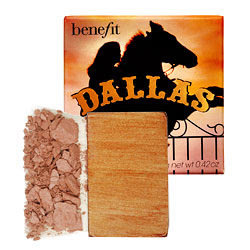 @BenefitCanada’s Dallas Blush is still one of the best blushes I’ve tried – simply because it looks so good on my tan skin and I can take it from summer to winter without trying really hard, and I can even use it as a light contour if I’m just sticking to the hollows of my cheeks. Girls with tan skin – such as myself – sometimes have trouble finding the perfect shade of blush. You want something natural, but go too light and it doesn’t show up on your skin, go too dark and it can look obvious and unnatural. Yes, it looks sort of bronzy mauve in the box and I’m not a fan of the packaging, but it really is the perfect colour and makes you look as if you’re glowing.